I wasn’t going to be a student forever, or much longer, for that matter. In all my years of being a student, I had never applied to this, mostly, because I didn’t really know what it was. Anyhow, I fit the criteria; so, why not apply? After the announcement went out, I received numerous congratulations, which continued throughout the conference. A friend brings me a printout that read, “The IGDA Scholars program is among the most coveted advantage for promising students in game development”– that’s about when the imposter syndrome set in. A friend, Geoff, congratulates me, showing me this printout on the scholars program. An All Access badge to GDC with no strings attached! 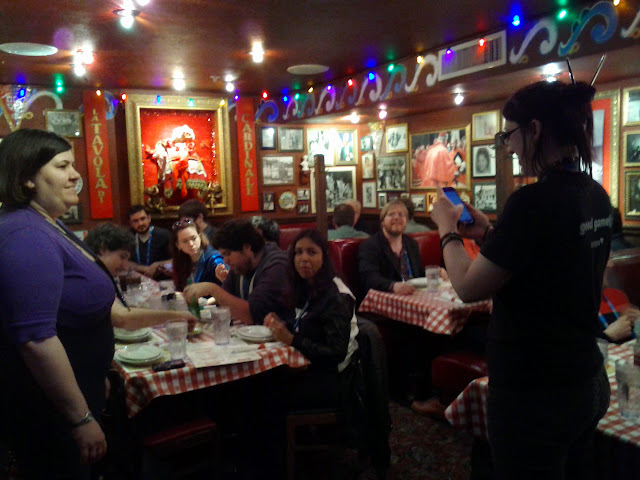 First getting to GDC, our orientation, and meeting the other scholars! Since I study Narrative AI, my mentor was a key figure in the Narrative Summit community. I went to the meetup, Sunday, before GDC, to be introduced to EVERYONE (which continued to happen throughout the conference as my mentor knew so many people). Being busy, himself, I felt undeserving of all the time my mentor spent connecting and orienting me in the biz. Here’s the mentors luncheon we had on the first day of the conference. Being an academic, not a lot happens outside of research and teaching. This is the Narrative Summit, where I saw the direct applications of my passion for games. That evening and the next morning, were writer meet-ups (which continued throughout the conference). Being not-a-writer, but a researcher who studies narrative (and with a CS background), it was a brand new experience for me. We met a few people at Double Fine, and even had an extended conversation with Tim Schafer himself. Daniel James, from Three Rings, spent a couple hours with us that afternoon, showing us his studio and sharing his experiences. It was clear that Warren Spector really cares about the developer community. He talked about his experiences in the industry and new endeavors with the academy (pun intended). Jenova Chen gave very thoughtful and intellectual insights into his experiences. Don Daglow told great stories about the history and foundation of this industry. The IGDA party is one of my favorite. It was the 20th year anniversary this year, so we all got cake! The Women’s Luncheon was similarly fantastic. It was an emotional event, as chords were struck (close to home). I must’ve started tearing up during the luncheon and then straight into #1ReasonToBe. The AI scholar, Matt, got to show his appreciation (and ours) at the IGDA meeting. It was a great session showcasing the facts and figures of what this organization is about. Thank you IGDA Scholars program! So many people put in so many hours on our behalf last week. I feel both undeserving and grateful! Here’s the skinny on Scholars! There was a GDC Video Game Themed Wedding. Best schwag of the year! How are you currently volunteering within the game development community? What volunteer efforts do you support that are not games related? I have most of my volunteer work listed on my CV: https://thoughtfulplay.wordpress.com/curriculum-vitae/ I’ve run a team of volunteers for the Monterey Jazz Festival’s Press Office for the past 7 years.http://terminaldegreejazz.wordpress.com/2013/09/24/terminal-degree-working-for-the-monterey-jazz-fest-press-office/ I’ve helped set up websites and blogs for non-profits and charities– mostly, teaching people how to use the internet to organize their causes. Organizations included a veterans center, food pantry, etc. I also run a jazz band that plays for many charities and fundraisers. http://tdjb.net In the distant past, I coordinated a trip to New Orleans shortly after hurricane Katrina and have helped with a few other similar charities in my undergrad years. Describe a game-related project (personal or academic) in which you’ve participated and explain your role in the project. I’ve made a few small indie games in my spare time, and even released one for iOS (https://itunes.apple.com/us/app/lab-bunnies/id532257972), but the most interesting game-related project has got to be my PhD dissertation on storytelling AI for video games. I spent many years working on evaluation and design for generative storytelling with several people throughout the 7 years of projects. In the final project that I am finishing up, I worked with an artist and a undergraduate programmer to build a fixed-asset story generator online. I was the lead designer and engineer on the project, as my PhD work must prove my own novel and original academic contributions. The technical framework can be found in this older publication: http://adamsmith.as/papers/a17-chen.pdf I have two publications under review right now. One is towards design and game studies of narratives and story, and the other is towards design and AI of generative storytellers. In my work, I’ve proposed a Declarative-Rhetorical design model that uses logic programming to establish spaces of meaningful story variations. In this work, I also define, in theory and practice, the need for Authorial Leverage in using AI with and for storytelling. A lot of my work focuses on story generation and drama management. What are your career objectives? How will attending this event help you to achieve them? I have three career objectives: (1) design and release games that utilize interesting forms of AI for storytelling, (2) design and release tools for creating better storytelling experiences, (3) write and publish papers, essays, and documents about game design and storytelling. In my pursuit of developing an expertise in storytelling AI, I’ve developed skill sets that don’t quite fit into the box of industry practice. I’m hoping to refine my experiences at GDC, through connections and conversation, towards knowing how to fit my unusual qualifications into the industry. I’d really like to meet people who are interested in narrative engineering or be able to learn about jobs where I can be a productive contributor on a project. In getting my hands on a larger project, I hope to develop insights that will enable better ideas for creator tools. I also have a great passion to write about my experiences and make the technology and development of video games as accessible as possible. If not too obvious, I could also use help setting career objectives, since having done grad school, my understanding of career is mostly development for research and education. I know this event will help me find answers and opportunities that I won’t be able to get anywhere else. Why do you think it’s important that developers help other developers? As a teacher of games and programming, I’ve taught students from middle school up to the college level. My teaching wiki is here: (http://teaching.sherolchen.com). When I taught this Summer for Stanford, I had many students from all over the world who were interested in games. Unfortunately, unless you are connected to the community of game development, it’s very difficult to understand what game development is, how you fit in, or even how you become a developer. To help with this, I had students as young at 11 years old blogging and reviewing games. I felt they needed to understand that their involvement in games is not limited to being a spectator. Without encouragement and help, these future developers may not have an opportunity to engage with the game industry. What I’ve found within the industry is that we have a small, yet very diverse, group of people. From my corner of being a student and instructor, I have not had the experience of a seasoned industry veteran. In that sense, having a mentor is a high priority for me as I graduate this year. Much of game development isn’t taught in school, and entering the work force is its own learning environment. It’s important especially for minorities and women to help each other learn the ropes of unfamiliar territory. I’m sure, even within the industry, there is always a need for a hand in learning something new. If you could visit one studio, anywhere in the world, where would you most like to visit and why? Describe what attributes you would look for in a mentor and why you would find them beneficial. The ideal mentor would be doing what I’d want to be doing 5-10 years from now. However, knowing what I want to do 10 years from know is not so easy. In that regard, a good mentor would have the time to get to know me, my abilities, and passions– even if it’s just a conversation over a cup of tea. Also, someone who’s aware of social issues in the workforce and in the world. Someone who values good character. Someone who knows how to take the right risks and when to go against the grain. Mostly, academic fellowships and scholarships. Tags: double fine, game developers conference, gdc14, gdc2014, igda, igda scholars, igdascholars, scholarship, three rings, women in gaming. Bookmark the permalink. I like the article a lot, but most of the pictures just have a grey “no entry” symbol and aren’t visible. I’m in the UK. What’s going on? I want to see them!